These soft fuzzy flowers top one of the most ornamental of all Salvias. 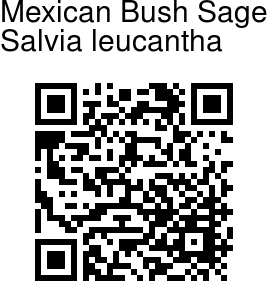 Mexican bush sage is a bushy evergreen subshrub. It grows in a loose, spreading mound up to 2-4 ft tall and about the same width. The leaves are lanceshaped, like willow leaves, 1-5 in long, puckery on top and white-wooly underneath. They are on stalks about an inch long and arranged in opposite pairs along the squarish stems. The young, fast growing stems are thick and conspicuously white-wooly. 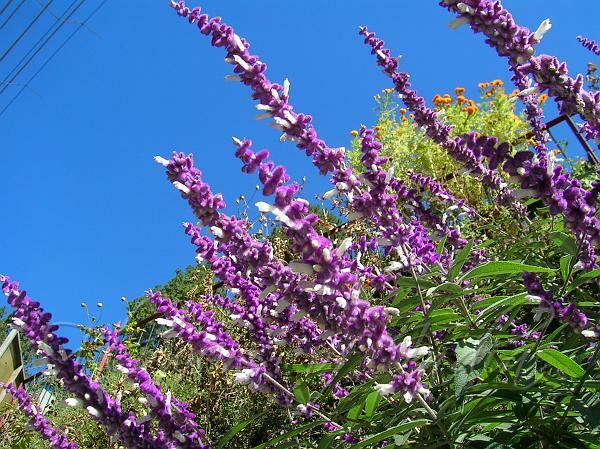 From autumn throughout winter Mexican bush sage blooms with white flowers 1-2 long that extend from velvety purple or lavender-blue calyces. The bicolored inflorescences are borne in very showy elongated arching clusters 6-12 in length at the ends of erect, spreading stems. At any given time, there will be just a few actual flowers per cluster, but lots of pretty purple calyces. These inflorescences are profuse and extend way beyond the foliage, making this one of the most attractive of the salvias. Some cultivars of Mexican bush sage (for example, 'Midnight' and 'Purple Velvet') have flowers the same color as the purple calyces.